Once I saw the synopsis of this book, I was sold. 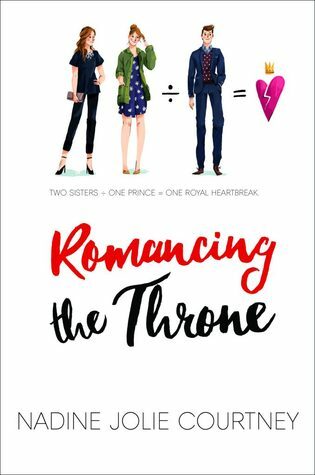 I love light, fun, modern stories about royalty and family ties, so I had a feeling I’d love Romancing the Throne. I did really enjoy certain aspects of it, but overall, with all of its aspects tied together, this book just wasn’t a favourite of mine. It was for sure fluffy and cute, but there were still major flaws that I couldn’t really overlook. To synopsize, this story follows a teen girl named Charlotte, who is competing with her sister Libby for the throne of Britain. The sisters are finally at the same school, so outgoing, frivolous Charlotte decides to introduce shy, reserved Libby to her social circle. With that comes a handsome prince named Edward, who is the throne’s heir. Suddenly, the sisters find themselves fighting over both the throne- and the prince. When I read books, the universal rule for me is that if I dislike a protagonist, then the book loses major points from me. This book was the perfect example of that. Charlotte was not a favourite main character of mine whatsoever, as she complained on almost every single page of the book and I found her to be rather stuck-up and insensitive. Basically, she was the polar opposite of me, and I prefer reading stories about characters I can actually relate to. For instance, if this book followed shy, sweet Libby instead, I would have enjoyed it that much more. One thing that I DID immensely enjoy about Romancing the Throne was its plot and royalty premise. When one hears the word “royalty,” they often tend to think of the medieval times and monarchs with their horses, crowns, and thrones. Or, sometimes they even think of fairy tales! I really liked that in this book, all of those stereotypes regarding royalty were smashed, showing us that monarchs are normal people. This book also stayed true to modern times with many mentions of social media and texting, which is something that many contemporaries seem to miss.